A wing blade allows operators to switch from an angle blade to a box pusher on the go, saving considerable time over disconnecting and attaching blades. Light and fluffy, heavy and wet, or dense and hard; regardless of the snow adjectives facing a contractor they certainly play a role in choosing the most effective and efficient snow removal equipment. But choosing a profitable tool requires digging a little deeper than snow type. Optimal versatility, efficiency, equipment longevity and uptime are all factors contractors must address and to do that means taking a close look at all contributors to the blade selection process, from applications and budgets to carriers and dealer support. Efficiency is the hallmark of any successful business, because in most cases it equates to higher profit margins. 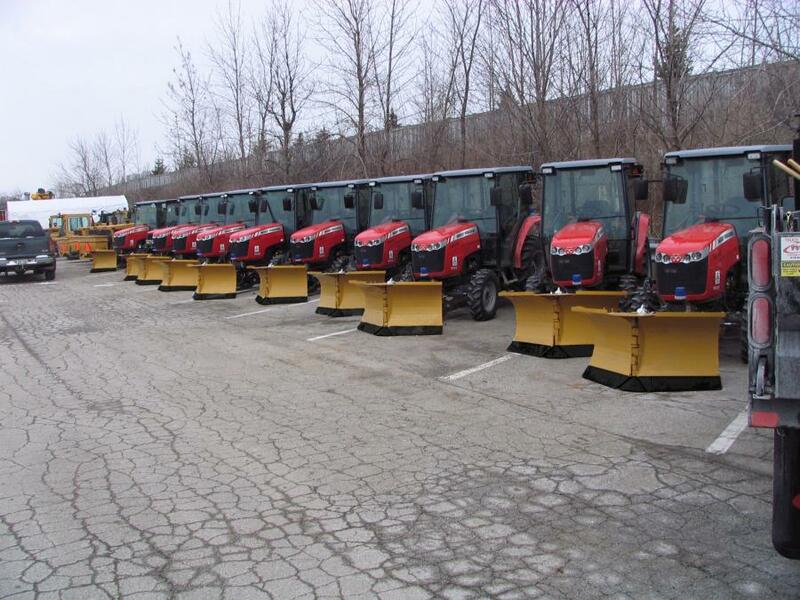 One of the most effective ways to improve snow removal efficiency is to match the blade to the application. 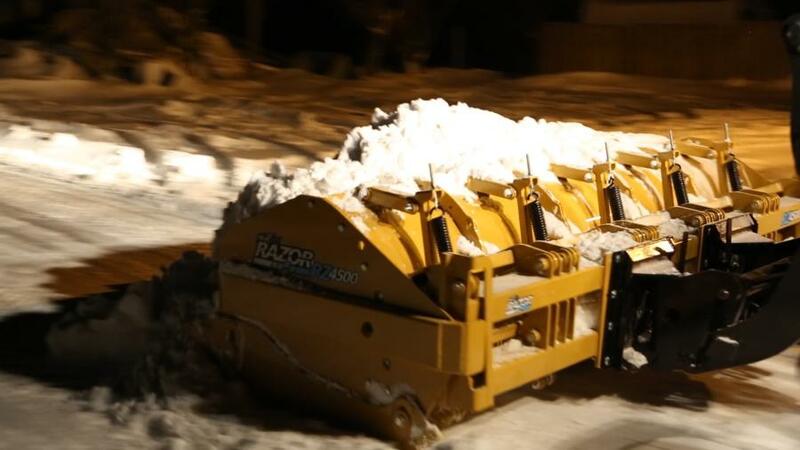 Contractors or municipalities clearing streets need a blade that can windrow snow to one side, allowing fast street clearing without stopping to push snow into a pile. This is why a blade that can angle to either side is critical for street clearing. When it comes to large parking lots, on the other hand, a box pusher works well since it allows operators to push a lot of snow long distances and stack it into piles. The challenge to maintaining efficiency, however, comes when contractors want to go from streets to parking lots and vice versa. They must stop, disconnect and attach the new blade, which is a hassle and, if it needs to be done multiple times a day, can quickly eat into profits. The ideal solution for maximum versatility is a two-in-one wing blade. This type of unit operates as an angle blade when its hydraulically-powered wings are open, then converts to a box pusher when the wings are brought ahead. Operators can switch from one to the other on the go, so it saves considerable time over disconnecting and attaching blades. The design also helps open new opportunities for contractors, allowing them to take on both street and parking lot work effectively and efficiently. Even though wing blades cost slightly more, the fast return on investment quickly diminishes the cost difference. Contractors using wing blades for clearing parking lots can complete projects as much as 60 percent faster than they can with just a box pusher. For accounts paid by the push or the season that means contractors can either pick up more accounts, adding to additional revenue, or have more time at home with their families while making the same amount of money. Even if it's an hourly contract, the added efficiency pays dividends. A customer who's happy their lot was cleaned quickly for business generally tends to be a loyal customer who offers great word-of-mouth referrals. Wing blades come in a variety of sizes to work with nearly any size carrier, from smaller 70-hp skid steers to 60,000-lb. wheel loaders. But when comparing one manufacturer's model to the next there are some key features to consider. Carrier tires are extremely costly. One punctured tire on the job can result in a service bill upwards of $3,000; and that doesn't factor in lost revenue. A tire protection system eliminates the risk of the blade wing puncturing the tire as it's angled. 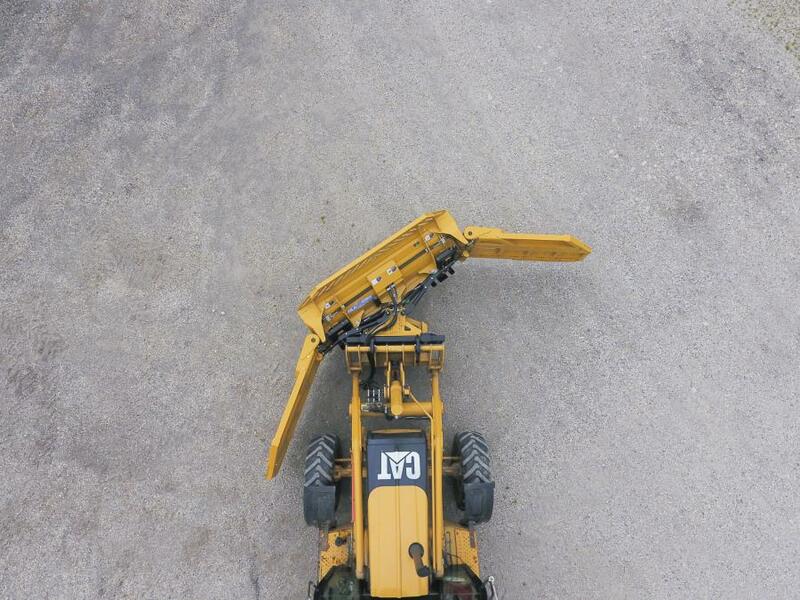 The mechanical system simply pushes the wing away from the tire as it's brought back, providing worry-free operation for both novice and expert operators. In addition to a tire protection system, the system powering the wing function on the blade can either increase or decrease maintenance costs. Wing systems are powered by either a rotary actuator or a ram cylinder. The rotary actuator system minimizes parts and offers a more robust system by eliminating pins and bushings. Also consider how the blade and carrier will be transported to the site and choose a wing blade that will minimize hassle and the need for over-width permits. Look for units with wings that can be rotated inward, which allows the blade, when angled — even when attached to the machine — to be loaded onto and transported by a heavy haul trailer. A two-in-one blade may not be ideal for all contractors, such as landscapers just starting out in the snow removal business with limited budgets and a smaller customer list. In this scenario a box pusher with a back drag is a great option. Contractors can use the units with nearly any size carrier, including smaller models such as skid steers, which are likely already in their fleet. Box pushers are great for pushing ample amounts of snow, but what makes a blade like this really work for most accounts is a back-drag feature. Back drag allows operators to place the blade within inches of a structure, such as loading docks, curbs and doors, then pull the blade back to clear the snow. These blades are often 35 to 40 percent of the cost of a two-in-one wing type of blade so it's a good option for those who don't have a lot of capital to invest, yet want to earn some serious business. Like most snow removal blades, box pushers are available in a variety of widths, generally 4.5 to 18 ft., and can be used with 5,000- to 60,000-lb. carriers to suit any size project. They are ideal for contractors who need to move a large amount of snow a long distance, such as in big parking lots. Unfortunately, it's a challenge to get the cleanest results with a box pusher. Parking lots are engineered for water control, which means they have high break points and low spots for storm sewers. For operators using a traditional rigid blade that can't conform to these varying levels, this can leave as much as 1.5 in. of snow in some areas, which means more time and money spent salting or sanding the lot. A better option for contractors working on large lots who want a cleaner scrape to minimize salt and sand usage is a blade that features several independent sections along its length. These sections are generally 24-in. wide and “float” along the surface; as the operator moves the carrier the sections raise or lower to follow the height of the pavement, leaving little to no snow left on the surface. Segmented floating blades can even be used to stack snow. Modern designs feature a full metal parallel lift system, which eliminates the risk of damage that can occur with polyurethane block systems when piling and stacking snow. These blades are generally available in 10- to 20-ft. widths and can be used on 14,000-60,000-lb. carriers. 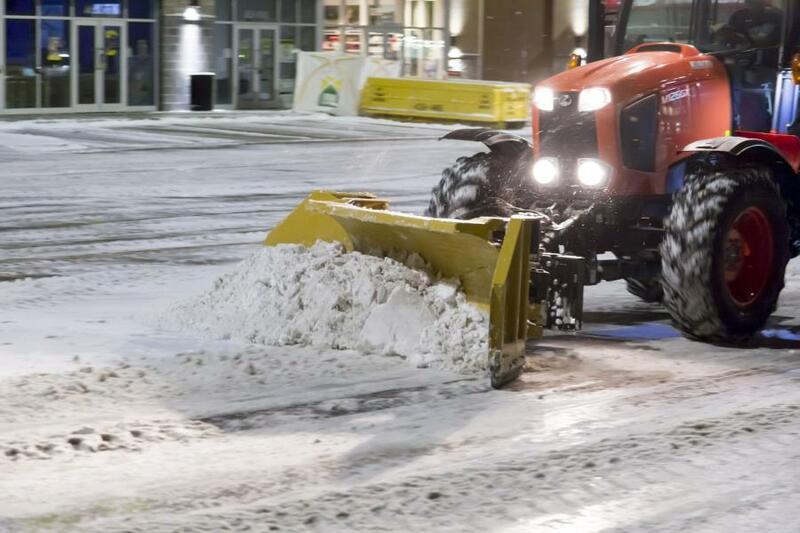 Having a versatile and efficient blade isn't just important for quickly clearing streets and parking lots, it's also critical for the safety of pedestrians on sidewalks. One of the most versatile options for clearing sidewalks is a six-way blade. These blades fit smaller carriers, such as 30- to 50-hp compact tractors and can be used to both windrow and push snow. Operators can angle the blade left or right to push snow to one side or the other, or use the v-blade function to push to both sides at once. Where this blade excels at efficiency, however, is at intersections. Operators can move the wings out to create a scoop, which is ideal for cleaning up areas around stoplights, then switch back to an angle or v-blade. This type of blade can save operators from having to make as many as three passes with an angle blade to clear snow from an intersection. There are many snow removal blades that work well regardless of location and snow type, but there also are a few options that excel at moving large amounts of snow in more challenging climates. Snow baskets, for example, feature cut-out designs that allow slushy water to flow from the bucket, while the bucket carries the bulk of the snow. This is ideal for milder maritime climates, such as the eastern United States and Canada where snow is wet and heavy. The cut-outs also reduce the basket weight so the carrier can carry more snow rather than more basket. Snow buckets are very similar to snow baskets, but feature cut-outs only along the top edge of the blade. These buckets are typically used with smaller carriers, such as skid steers, so the cut-outs give operators a clear view of the cutting edge. Snow baskets and buckets are typically available in 5- to 10-ft. widths and for use with 5,000- to 15,000-lb. carriers. Regardless of blade type it's important to keep an eye out for a few features that will help ensure blade longevity and minimize downtime. A carbide-tipped cutting edge, for instance, can last as much as seven times longer than traditional heat-treated steel blades. For a contractor or municipality operating multiple plows that can add up to saving a lot of shop time associated with replacements. Rubber cutting edges present another option, but keep in mind they don't do well in cold dry climates. Rubber becomes brittle when cold and if used on dry pavement they will tear quickly. Rubber cutting edges should be used more like squeegees where there is always lubrication from water. This is why they are ideal for milder climates. In addition, look for blades with a spring trip cutting edge. These edges trip back and bounce over obstacles and then spring forward to their original position. This protects the blade and carrier from damage as well as the operator from injury if the blade hits a manhole or unforeseen protrusion. Lastly, a good rule of thumb to choosing a durable blade is if it doesn't look high-quality, 99 percent of the time it isn't. A high-quality snow removal blade will have thick steel and adequate welding where needed. One of the most critical aspects to minimizing downtime is to ensure wear parts, such as cutting edges, wear shoes and hoses, are available when needed. Therefore, working with a trusted and knowledgeable dealer is important. Choosing a blade made in North America also ensures parts are available quickly. These types of manufactures typically work closely with dealers and provide support for troubleshooting and blade selection. Work with a local dealer who can provide recommendations on blades based on regional factors, such as snow type and types of carriers. For example, a dealer in Maine may recommend a 2-ft. shorter blade for the same carrier in North Dakota since snow in the east is generally wetter and heavier. Whether faced with dry, wet or heavy snow, moving it efficiently while leaving precise clean results can be a challenge. But where there's a challenge there's a way, and the best way to ensure optimal results is to choose equipment that offers the most profit potential for the application, budget and location. For more information, call 866/567-4162 or visit www.hlasnow.com or www.horstwelding.com.